One of the advantages of having an event like the L.A. Zine Fest is that you are offered an opportunity to meet like-minded people who tell you about new and interesting events. 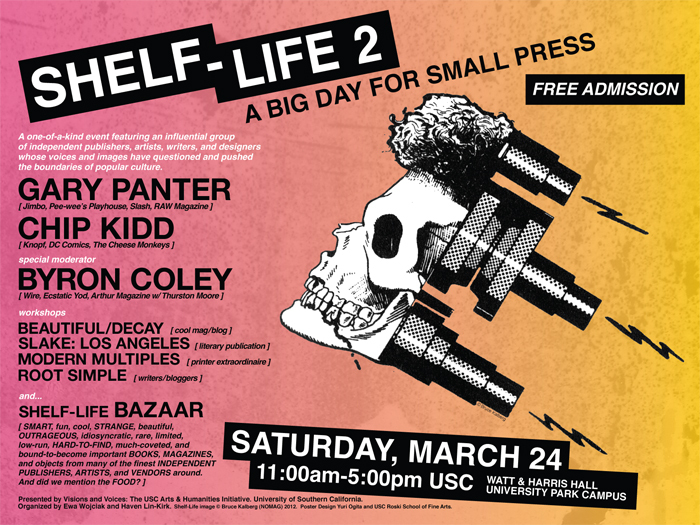 One such event is Shelf Life 2 at USC, which is free and open to the public. SMART, fun, cool, STRANGE, beautiful, OUTRAGEOUS, idiosyncratic, rare, limited, low-run, HARD-TO-FIND, much-coveted, and bound-to-become important BOOKS, MAGAZINES, and objects from many of the finest INDEPENDENT PUBLISHERS, ARTISTS, and VENDORS around. In order to ensure that there are some very interesting conversations, Shelf Life has assembled a killer list of guest speakers and workshops. The workshops at this event range from a discussion with Slake Magazine on the importance of narrative (a hands-on element is implied!) to an opportunity to make a collage that will become part of a collaborative zine with Beautiful/Decay. Plus, Chip Kidd in the flesh! His book covers are incredible, and his novels are capable of lighting a fire under the butts of procrastinating artists of all media. Check the website for details on all workshops. < Mari Naomi reads at the LA Zine Fest Comix and Zine Reading!